The Arkansas FAITH Network team. From left, Joy Rockenbach, Rev. William Givens, Tiffany Haynes, Ph.D., and Keneshia Bryant-Moore, Ph.D., R.N. May. 17, 2018 | May 17, 2018 | The Arkansas FAITH-Academic Initiatives for Transforming Health (FAITH) Network has been selected to participate in the National Leadership Academy for Public’s Health program, funded by the Centers for Disease Control and Prevention (CDC). The Arkansas FAITH Network is a collaboration of the University of Arkansas for Medical Sciences (UAMS) and faith-based organizations. They work to deliver health programs and health education to faith communities across the state. The Arkansas FAITH Network team will work on an applied health leadership project that tackles an important population health issue with the goal of improving public health outcomes. The team consists of Keneshia Bryant-Moore, Ph.D., R.N., associate professor; and Tiffany Haynes, Ph.D., assistant professor; both from the UAMS Fay W. Boozman College of Public Health. The other members are Joy Rockenbach, faith-based coordinator at the Arkansas Department of Health, and Rev. William Givens, minister of Christian education, St. John Baptist Church. Bryant-Moore is the team lead for Arkansas FAITH Network. “This is a great opportunity for academia, public health and faith/community leaders to not only have training and support from the national program and the CDC, but to really dig deep and address population health with those most affected by illness due to health disparities,” Bryant-Moore said. Arkansas ranks 48th in the nation in overall health status and ability to access health care. Individuals in Arkansas are more likely to report engaging in behaviors such as smoking and lack of physical activity that place them at risk for developing chronic health conditions. The team will address three health issues due to disparities experienced in racial/ethnic minority communities and vulnerable populations including mental health, obesity and diabetes over the next several years. Initial projects will focus on mental health. The National Leadership Academy for the Public’s Health will provide training and support to assist the team in successfully addressing mental health in Arkansas. Training and support will focus on two tracks. The first is the development of leadership skills, including personal and collaborative leadership in a multi-sector environment. The second emphasizes growth from team-based collaborative work to policy and systems change. 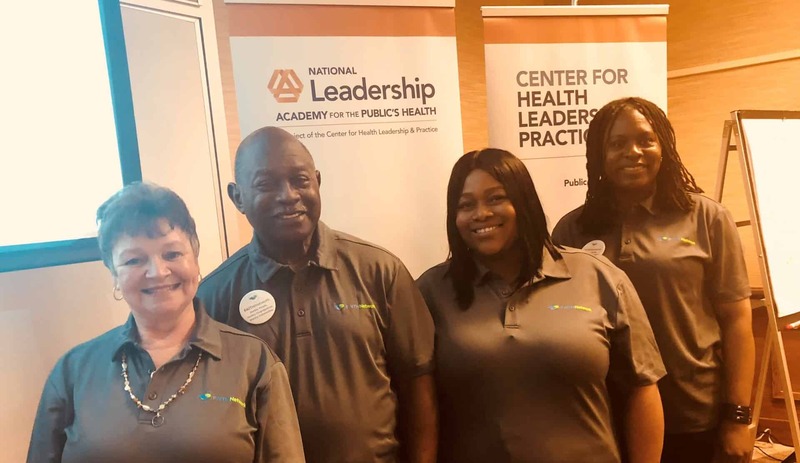 The National Leadership Academy for the Public’s Health is a national program focused on improving population health by working with multi-sector leadership teams and training the teams through an applied, team-based collaborative leadership development model. The program is implemented by the Center for Health Leadership and Practice, a center of the Public Health Institute and will provide training and support for one year.